Species are often hard to detect in ecological surveys. They might hide from searchers – think of a frog hidden high in a tree. Or seeds of a plant might be present, yet the adult plants themselves might be absent until the seeds germinate. Or for migratory species, individuals might only be present at a site for a short period. How can we be sure that a species is truly, and permanently, absent? CEED works extensively in the area of imperfect detection because the consequences are profound. 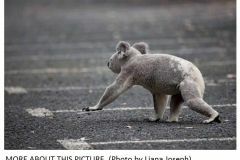 Threatened species can remain undetected for years, even being listed as extinct when they in fact persist. These seemingly “extinct” species are sometimes rediscovered, with the moniker of “Lazarus species” alluding to them coming back from the dead. To help estimate the chances of such happy surprises, CEED published a new method to infer the probability that a species is extant given a set of sighting records (Lee et al. 2014). Some species that are wrongly thought to be extinct might suffer if management to help them were to cease. If this misapprehension and premature cessation of management were to cause their extinction, then they will lose their chance of becoming Lazarus species, and instead run the risk of becoming “Romeo species”. Yet we don’t want to manage a species indefinitely. For example, we would be unwise to manage in the hope that the dodo was still extant. Our previous research addressed the balance between the risk of curtailing management too early and managing for a threatened species that is extinct. We have now applied these ideas to invasive species management, but with the risks reversed. In the past, invasive species have been seemingly eradicated and control efforts wound back, only for them to rebound and cause further harm. We might call them “Voldemort species”. Tracy Rout developed this idea of deciding when to declare successful eradication, and applied it to control of foxes on Phillip Island, Victoria (Rout et al. 2014). Foxes threaten little penguins and other island fauna, and managers are attempting to eradicate them. In addition to developing the decision theory for declaring eradication, this specific application has helped the island’s managers make substantial further investments in fox control. Imperfect detection is also relevant at landscape scales, with CEED demonstrating significant understanding of the distributions of species (Lahoz-Monfort et al. 2014). This paper even has its own movie: http://tinyurl.com/sdm-det. We have also further developed methods to allocate surveillance effort across landscapes (Guillera-Arroita et al., 2014), over time (Moore et al. 2014), and when integrated with other management options (Rout et al. 2014b), building on our previous research. Application and further development of this research has contributed to a body of work on managing invasive willows and hawkweeds in the Victorian alps. Led by our collaborators Joslin Moore, Nick Williams and Roger Cousens, and involving CEED researchers Cindy Hauser and Kate Giljohann, these two projects were awarded the Nancy Millis Science in Parks Award in 2014 (http://parkweb.vic.gov.au/about-us/science-awardscience-award). Lahoz-Monfort JJ, G Guillera-Arroita and BA Wintle (2014) Imperfect detection impacts the performance of species distribution models. Global Ecology And Biogeography 23(4): 504-515. 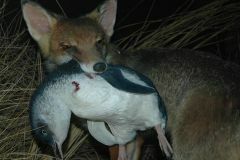 Photo: A fairy penguin in the jaws of the red fox, Phillip Island, Victoria. Managers are working to eradicate foxes from the island. Photo by Phillip Island National Park.